For a while I was on a smoothie kick. And by a while, I mean a week. And by a kick, I mean I had one for breakfast… every. single. day. They were delicious. I have no regrets. I’ve been staring at these pictures all morning thinking to myself: whyyyyy didn’t I make one of these, instead of eating Eggo’s, for breakfast? Oh yeah, because I don’t have any bananas. And Target is like two blocks away. Which is two blocks too far when my hunger sets in. Let’s aim for one of these tomorrow, before Sunday morning yoga, shall we? So, these smoothies came about because of a few things. First, my local lululemon store has been giving out free Zico coconut waters at every class. I like the chocolate ones, but I’m not a huge fan of the plain ones. I needed to come up with something to do with them, since I keep taking them just because they’re free (they’re full of good stuff.. or so I hear). 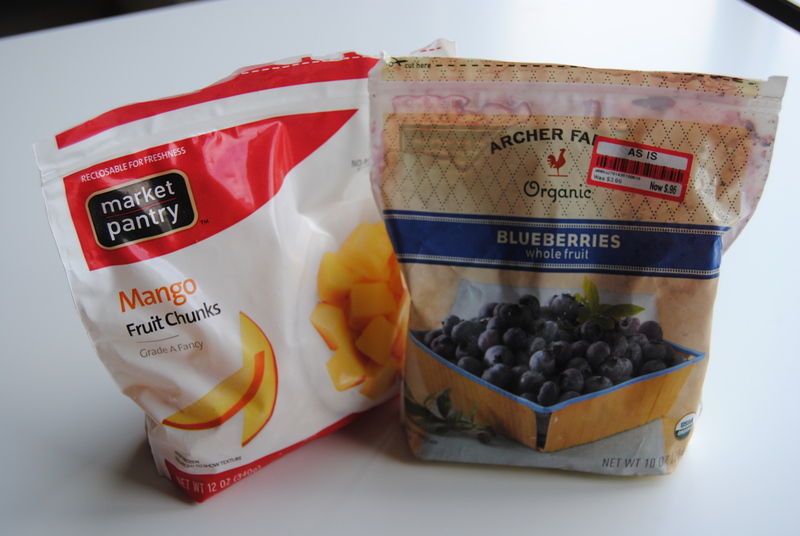 Second, I had these (and a few other) bags of frozen fruits in my freezer that need to be used. I have a hoarding problem. I may (or may not) have 15 bags of frozen fruit in my freezer. In my defense, they’re different types and the were on sale! 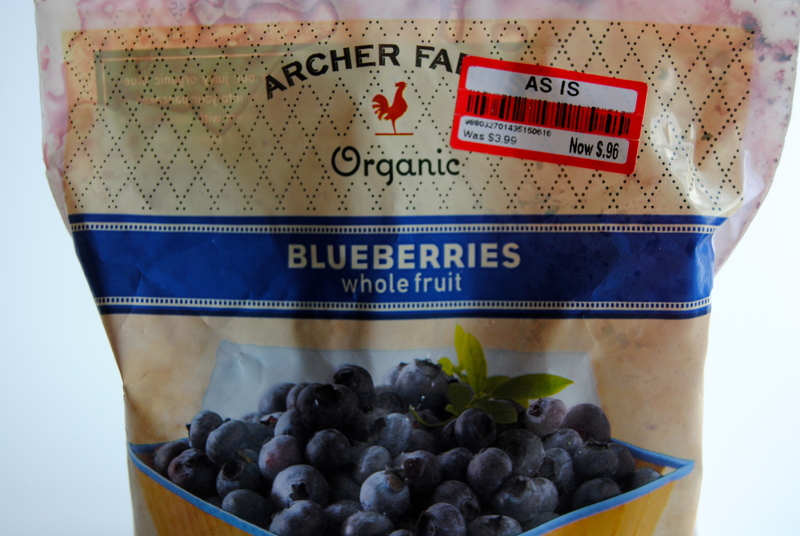 These Archer Farms frozen blueberries were only $0.96! I’m a sucker for a good sale, I blame my mother. I also blame her for the stacks of coupons that are currently sitting on my dining room table that I need to sort into my coupon binder. I have a confession to make: I truly have no clue what I’m doing with this “food photography” thing. I put the smoothie in a spoon. I’m pretty sure that breaks the laws of food blogging or something. I’M TRYING TO LEARN. You’re just going to have to bear with the weird styling choices for now though. I’m actually headed to a photography class after I finish this post! I’m super excited, no more “auto” setting on this girl’s Nikon. Not uh. One of my favorite things about this smoothie, besides how awesome it tastes, is how full it keeps me. There’s a whole lot of stuff in there that will give you energy, at the very least, until your lunch. I never need a mid-morning snack when I have one of these. It also gives me a good dose of calcium; because I rarely have dairy, I’m always trying to trick myself into getting calcium. The last thing you should know about this smoothie is that the chia seeds are optional. However, I always put them in, not only for the nutritional benefits, because the seeds expand to a gel like substance which keeps the smoothie “smooth” even after the ice melts. I normally throw the whole smoothie (both servings the recipe makes) into my reusable Starbucks cup and sip on it all morning. I usually don’t want to share it… I’m greedy. I hope you’ll forgive me. If you have a roommate/kids/a live-in significant other this would be perfect to split… if you’re into that. Or, you could always double the recipe, if you don’t like to share like me. 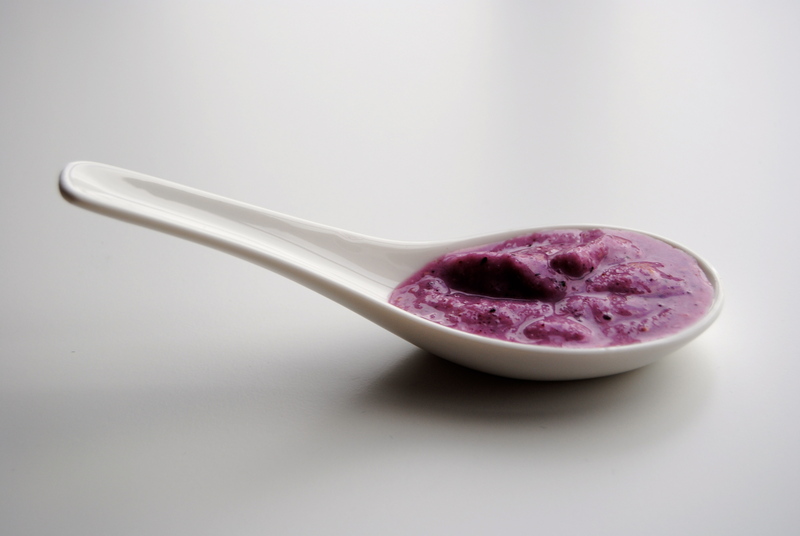 And yes, I did eat the smoothie off this spoon after I was done taking (what I consider to be) artsy pictures… I’m not into wasting. Sue me. 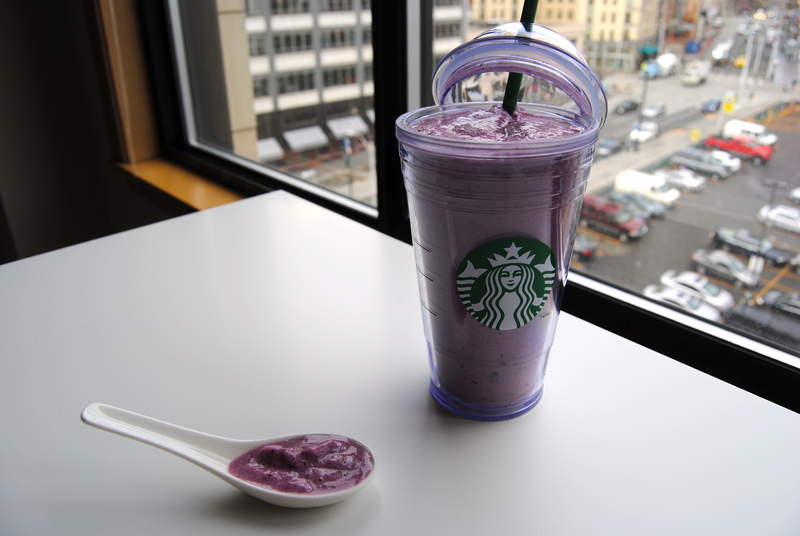 Combine ice, oats, yogurt, fruit, chia seeds (if using), and about half of the coconut water in the blender and pulse. Add more coconut water until mixture is smooth. Add banana to blender and combine, adding more liquid if necessary. Serve immediately or refrigerate until served.